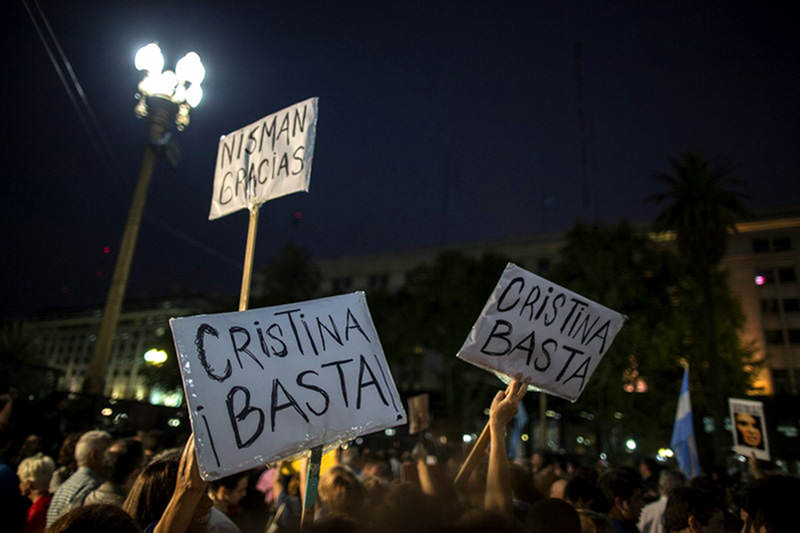 Pro-US demonstrates against President Cristina Fernández de Kirchner after the death of Nisman. We must now examine the context in which the Nisman case occurs. In this context of the cristinismo wanting to put limits to the parallel Government of the SIDE, changing its headquarters, moving heads in the shadow but mostly relying on the intelligence military. It is under these conditions that are registered to the current “appliances war” of which it forms part to the death of Attorney Nisman, a man linked to the US State Department. Therefore, the death of Attorney Nisman, as part of a confrontation of the bourgeois pro-imperialist State intelligence, is not a death of our class; we neither cry for nor claim it. The manoeuvre of the bourgeois opposition has all the features of Islamophobia driven by imperialism against the oppressed peoples, who are after the greatest wealth of energy on the planet, as they are in Iran and the Hezbollah attacks through the media. What is to see which is an attempt to move to Argentina of the Russian-Chinese Centre. Workers should reject imperialism campaign mounted by the opposition bourgeois and followed by the left pseudo Trotskyists such as PO (Workers’ Party (Partido Obrero, leader, Jorge Altamira), IS (International Socialists), CS (Socialist Convergence, Convergencia Socialista), PSTU (Unified Socialist Workers’ Party (Partido Socialista dos Trabalhadores Unificado). The cristinismo in still bourgeois party who is not able to give a real battle against imperialism because it fears to mobilize the proletariat. Is therefore unable to disrupt the opposition sepoys. Workers must get rid of the influence of Peronism and of all bourgeois tendencies. They should primarily rely on their own independent class methods to fight the battle against imperialism, his national actors and also against the Government of Cristina, thus establishing a government of the working class and all who toil. ● For the dismantling of the repressive apparatus! ● Defeat the opposition pro-imperialist sepoys! ● No confidence in the Government of Cristina! Sepoy, an indigenous soldier serving in the army of a foreign conqueror, especially an Indian soldier serving under British command in India, hence a politician in the service of foreign imperialist powers.